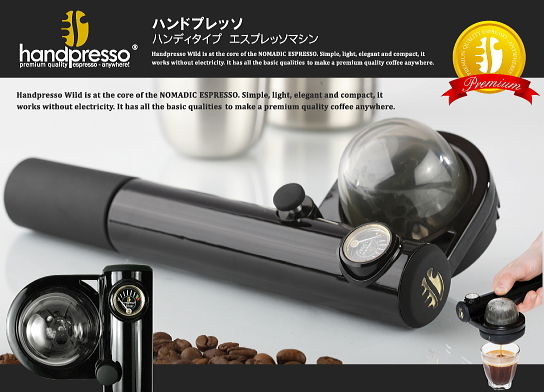 Espresso Machine portable is a mobile type espresso machine developed in France. Handy Espresso Machine is a mobile type espresso machine developed in France. 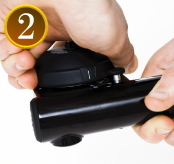 Now you can enjoy real espresso anytime and anywhere with "Handpresso". Since it works by just pumping the machine with no electricity, you can take it to your trip and enjoy tasty espresso in your hotel rooms, mountains, beaches and other places. Enjoy special time with premium quality espresso! It is compact, easy and Eco! No electricity required. 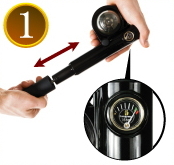 Pump until the pressure gauge goes to a green area. Detach the extraction filter. （Before pomping is fine, too.） Pour hot water in the water tank. Cafe Pod(*1) is put on the Pod holder. Close the extraction filter. If you the extraction button is pushed, the espresso is extracted. Coffee pods are freshly roasted coffee, ground perfect, tampered to the correct pressure and then encapsulated in a paper. 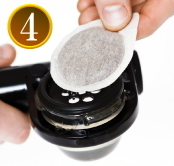 There are many sizes of coffee pods now available, but mainly the two sizes are now used by most coffee machines. the most popular are 44mm and 55mm. 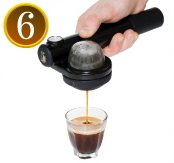 Our Espresso Machine portable is made for 44mm. By using pods in your machine not only can you guarantee perfect results, there is no mess and pods help to look after your machine. In fact used pods can even be used as fertiliser for your garden ! You can take Handy Espresso Machine to your businesstrip and personal trip putting in your bag since it is handy! You can enjoy premium quality espresso anywhere. Espresso Machine portable's Size is only 22cm(L) x 10cm(W), so it is good for the house has no place to put regular espresso machine. 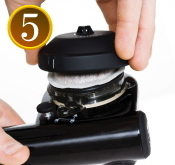 Why don`t you put your favorit coffee pods and Espresso Machine portable in your desk drawer? Then you can relax and refresh by rich eapresso aroma! Just imagine that you enjoy your handmade espresso in the spectacular nature. Take it to the outdoor activities! Espresso Machine portable wins a lot of prizes. Personal air purifier on your neck [Air Supply]! Elimiinated 95% of bacter in experiments. Automatic hard floor cleaning machine invented in Norway. 2-WAY sports sunglasses 「ClipOn」　"Clip On" attached directly to a cap. A clothes compression bag that doesn't need a fastener due to its double-sealed structure with special PVC film.